SEIVA CardioTouch – SEIVA s.r.o. SEIVA CardioTouch is twelve-lead electrocardiograph suitable for cardiological clinics and practice. The device excells with its large, touch, well-arranged, TFT display with high resolution. On such display all 12 leads can be easily monitored. Modern laser printout ensures extraordinary longevity and quality of record. Clear ECG record – CardioWriter works with resolution up to 46 points/mm. That is five times more than thermopaper ECGs. That is why the ECG trace is of such a high quality. Operation of the device is simple and fast. For ECG record to be taken, all that is needed is pressing one button. Identification patient data can be entered easily by keyboard. Transfer of patient data to external electronic archive is automatically done. SEIVA CardioTouch can be upgraded for ECG Stress test, spirometry and many other modules. 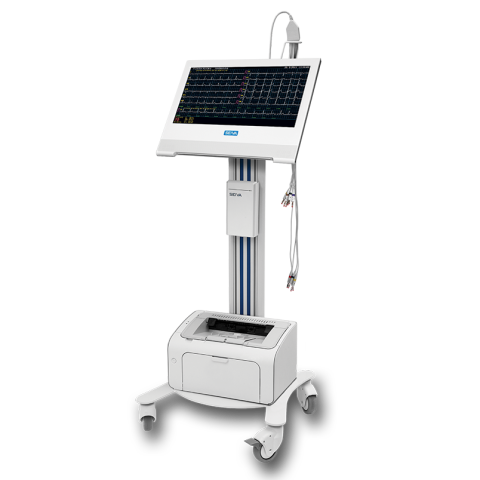 Large colour 15″ TFT display with high resolution shows all 12 ECG leads without compromise. Display of ECG curves on monitor and on paper is identical – WYSIWYG. During monitoring of ECG curve on display any number of ECG stripes can be entered. Laser method, which CardioTouch uses, is one of the best quality and reliable methods of printouts ever known.